Mercedes-Benz has developed a CO2 based air conditioning system for its vehicles which meets the forthcoming EU climate protection targets. In order to comply with the legal provisions going into effect in 2017, Mercedes-Benz will equip its vehicles with air conditioning systems that meet all the relevant performance and safety requirements. The Stuttgart-based automobile manufacturer will exceed the EU’s climate protection requirements. From 2017, it will offer in Europe the S- and E-Class as the first production passenger cars equipped with CO2 air conditioning systems. These completely newly developed systems are based on the DIN specifications defined by the automotive standards committee of the German Association of the Automotive Industry (VDA). Thanks to their especially quickly available and high cooling performance, CO2 air conditioning systems swiftly provide for a pleasant feel-good climate inside vehicles even in very hot weather. In combination with their high environmental compatibility, this makes them the sustainable premium solution among air conditioning systems. The use of CO2 as a refrigerant necessitates the redesign of crucial components. CO2 air conditioning systems operate at a pressure of more than 100 bar – some ten times higher than that of today’s systems. This means that all components including the hoses and seals need to be redesigned. Mercedes-Benz has drafted corresponding standards together with all German automobile manufacturers and numerous suppliers in the automotive standards committee of the German Association of the Automotive Industry (VDA). The publicly accessible DIN specification documents also offer other companies an opportunity to quickly launch development activities of their own. This would create the prerequisites for swift market penetration by this high-tech air conditioning system. Mercedes-Benz has assumed a pioneering role in this respect. It is the first automobile manufacturer to award not only development contracts but also to place production orders for CO2 air conditioning systems and their components. Despite the exceptionally short time frame, the high level of quality targeted by Mercedes-Benz for CO2 air conditioning systems has already been realised in the new development for the company’s top models. Deployment throughout the entire vehicle fleet will not be feasible by the effective date of the new EU directive on 1 January 2017. In order to also meet the EU requirements on schedule for all other model series, the company has developed safe and reliable systems for the use of a synthetic refrigerant, which is used throughout the entire automotive industry. Apart from CO2, R1234yf is the only refrigerant produced on an industrial scale to date with which the future requirements of the EU directive for air conditioning systems in new vehicles can be met. The new directive stipulates a limit of 150 for the global warming potential (GWP) index. The R1234yf refrigerant is known to have different flammability properties than the R134a refrigerant used in the industry to date. 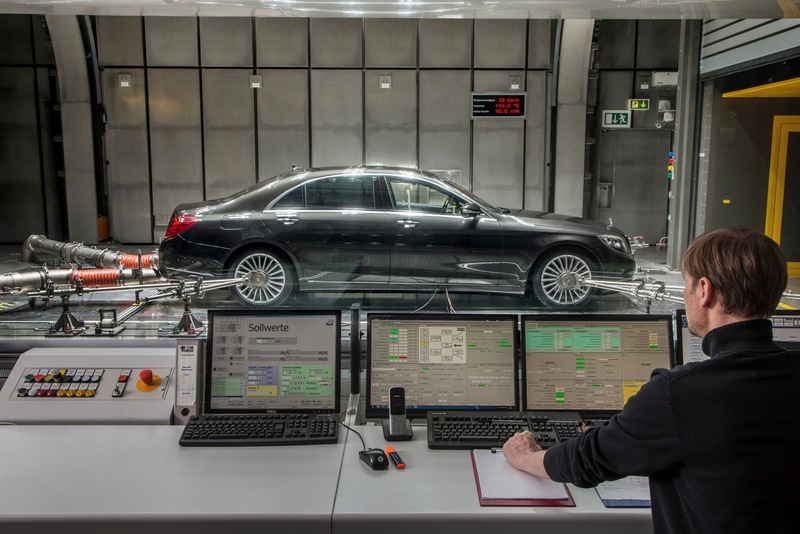 In order to ensure a continued high standard of safety for its customers in the future, Mercedes-Benz has carried out extensive testing on all its vehicle models. The result is a comprehensive package of vehicle’s specific measures in order to guarantee Mercedes-Benz’ high safety standards for the models using the R1234yf refrigerant. In particular, these include a specially developed protective system tailored to the given vehicle configuration. In the event of a severe frontal collision, the patent-pending system ensures that the resultant refrigerant/air mixture is separated from the hot engine components in the engine compartment and that these components are furthermore cooled in a highly effective manner. This is made possible by a gas generator, which releases inert argon gas specifically at the relevant hot spots. This effectively keeps the mixture from bursting into flames. As a result, this ensures that customers’ justifiable safety needs and Mercedes-Benz’s high safety standards will continue to be met in the future. At the same time, it also provides the company with another means of helping to protect the climate.